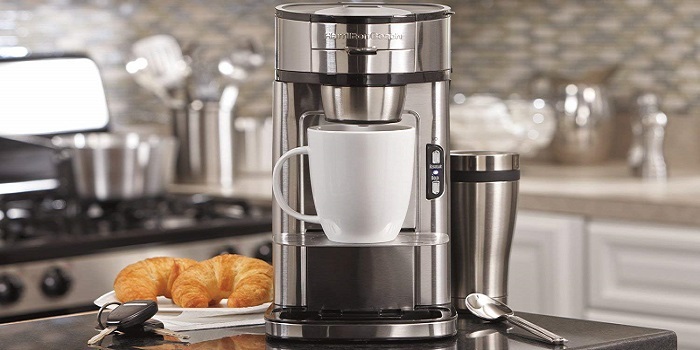 • Espresso machines - allow you to make fresh coffee using a wide range of ground coffee. They tend to be significantly cheaper and lighter than bean-to-cup machines, while offering more flexibility than capsule coffee machines. 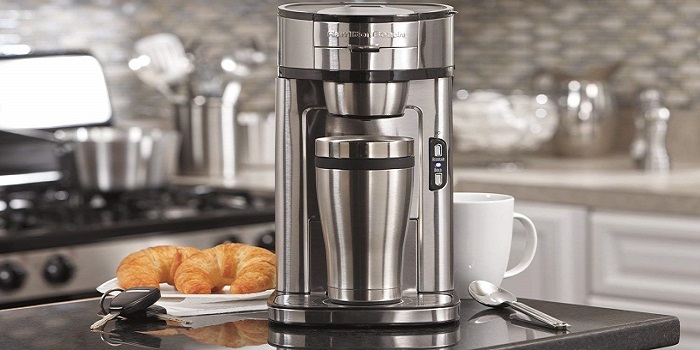 • Bean-to-cup coffee machines - have an in-built grinder to produce the freshest coffee possible on demand. They tend to be easier to use than traditional models and more expensive than other coffee machine types. • Percolator - offer consistent brewing. However, they tend to produce a bitter coffee, and are time-consuming to brew and to clean the grounds basket. 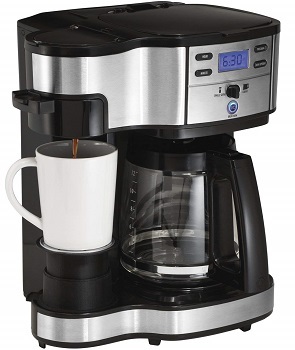 • Automatic Drip Coffee Machine - offer programmable, fast and reliable brew. However, they require purchased filters, impossible to regulate water temperature for different types of beans, and can't adjust the time that the water and coffee steep. • French Press - does not require electricity to operate while offering a full control over water temperature and brewing time to produce richer, fuller flavor. Good coffee makers take less than 15 seconds to make 30ml and stop dripping. • Bar pressure: This is the speed at which the hot water is forced through the coffee, with between 15 and 19 bars considered optimal. • Thermoblock: The heating element that boils the water to the perfect temperature. • Filter holder: Used for holding the granules, with aluminum on cheaper models, while brass is preferred on pricier machines because it retains heat better. There is a great advantage if you buy your coffee maker online is that you can see directly the opinions of other users. And that is why large and trusted online retailer like Amazon.com displaying their customer reviews including the star rating. It will give you a real picture of a product you plan to buy. The more the number of buyer reviews and the higher the star rating, the better the product in the eyes of consumers. 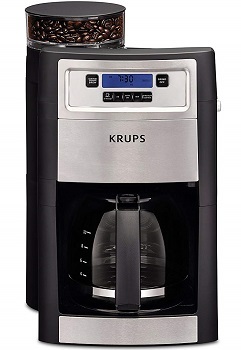 KRUPS KM785D50 provides a flawless coffee-making experience, with programmable auto-start to schedule the brew cycle and a 2-hour keep-warm feature for Coffee that's ready just when you need it. • Highly intuitive control panel with crystal-clear LCD display. • A bit difficult to use owing to the numerous settings. • No scratches or esthetic issues. • Removable drip tray to fit some travel mugs. 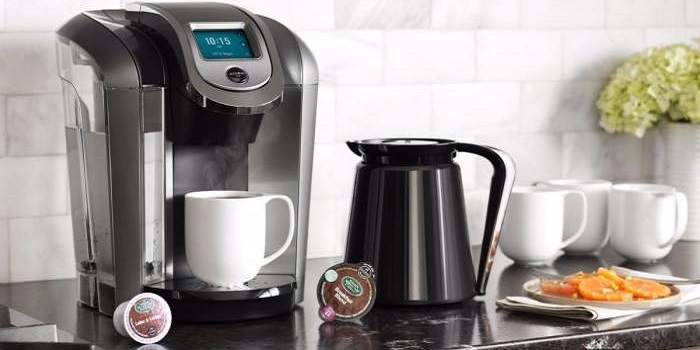 • Includes 4 K-Cup pods, a water filter handle and 2 water filters to help your beverages taste their best. 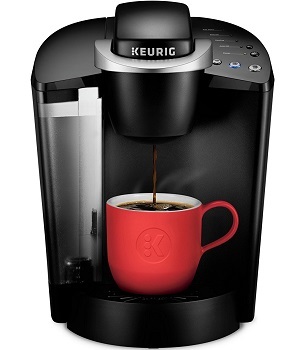 • Brews multiple K-Cup pod sizes: (6, 8, 10 oz.). • Large 48 oz. removable water reservoir: allows you to brew 6+ cups before having to refill. • Descaling: helps to remove calcium deposits, or scale, that can build up inside a coffee maker over time. 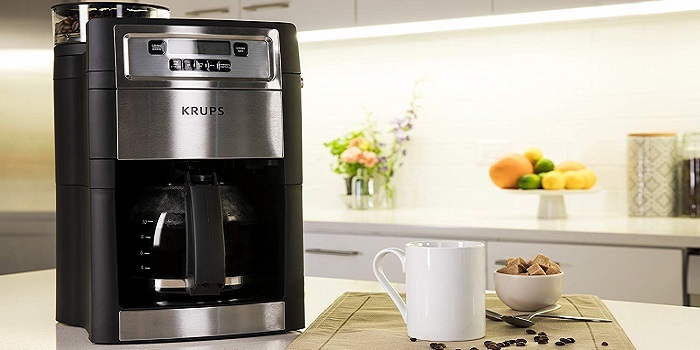 • An auto-off feature is easily programmed to turn off your coffee maker after it has been idle for two hours, helping to save energy. 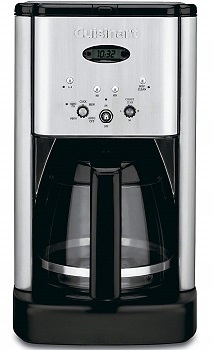 Mr. Coffee BVMC-SJX33GT-AM brings style, taste, and functionality together to create a rich blend. 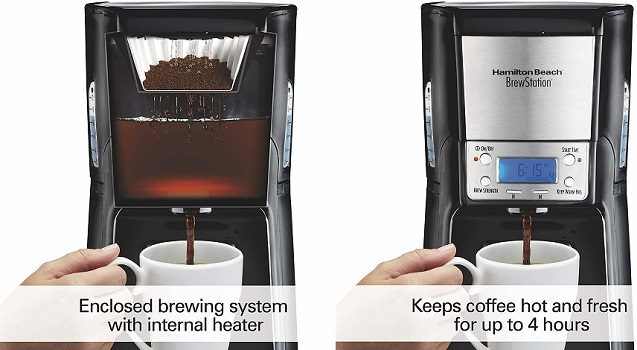 It comes with 2-hour auto shut-off will keep your coffee hot for 2-hours and then automatically shuts it off. And since coffee is all about taste, you'll be glad to know that the Water Filtration system removes chlorine and impurities from the water during the brew cycle. • No hint of plastic smell/taste. 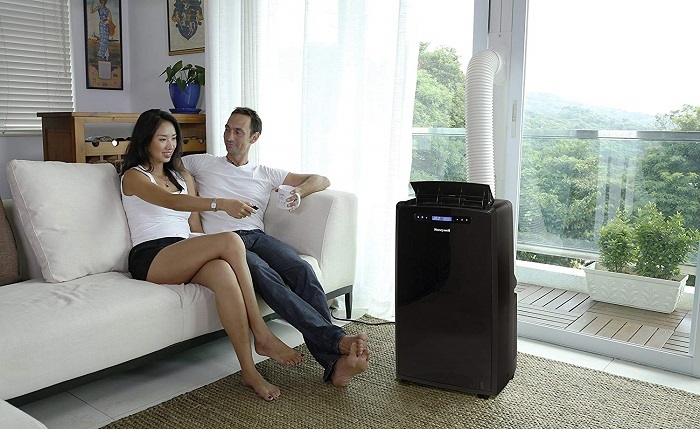 • Filter basket is easy to access. • Efficient, reliable cleaning system. • Coffee doesn't stay hot. • LCD Clock display not illuminated. • Must be pulled out from under cabinets to fill with water. 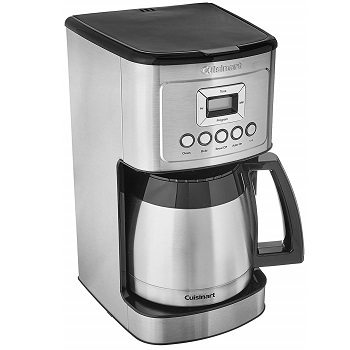 Cuisinart DCC-3400 comes with cutting edge Coffee technology to give you hotter Coffee without sacrificing taste. • Coffee stays hot for the entire day. • Bold button makes the coffee stronger. • Carafe is not see through. • When it comes to customizable flavors, you only have a choice between regular and bold. 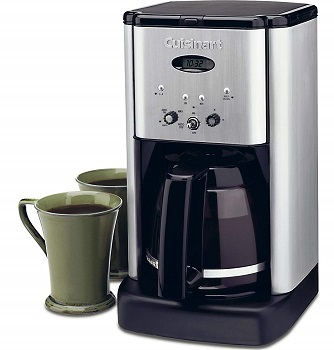 Cuisinart DCC-1200 boasts wake-up feature so you don't have to spend one waking moment caffeine-less. • Carafe is dishwasher safe. • Light alert for self cleaning. 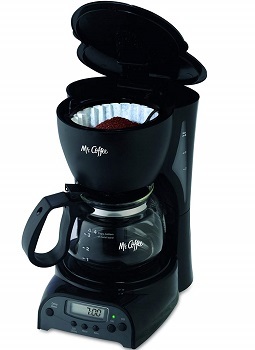 • No need for coffee filters since the machine comes with a reusable filter that works pretty well. • Some customers found it difficult to tell just how much of the water stayed in the reservoir especially if the brewing process was discontinued mid-way. 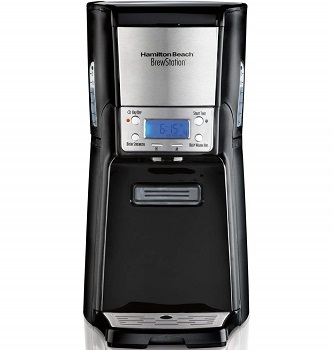 Hamilton Beach 49980A is a low-maintenance coffee maker that can brew a basic or premium roast coffee in a fraction of the time and cost as the coffeehouse. It gives you a complete sensory experience of tasting freshly ground coffee, without the hassle of messy grinds or exact measuring. • Can use with K-cups and pods. • Easily switch from carafe to single serve and back. • No option to keep LED clock light on. 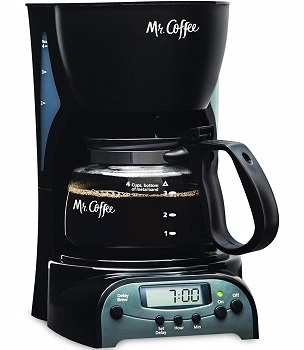 Mr. Coffee DRX5-RB helps you make rich-tasting, expertly brewed coffee without stress or mess. • Easy to clean and use. • Small footprint; great for tight spaces. 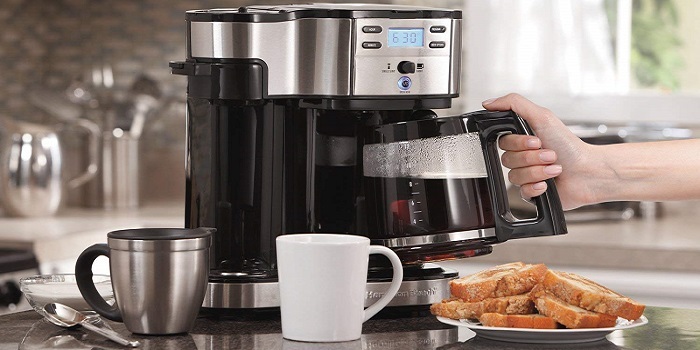 Hamilton Beach 49981 aims to combine simplicity of use with value for money and great tasting coffee. It`s ideally suited to anyone who doesn’t want to use pod coffee but still wants the ease that comes from a single serve machine rather than an often complicated barista style machine. • Good flavor of coffee. • Does not clog with dark/oily roasts. • No auto start feature. 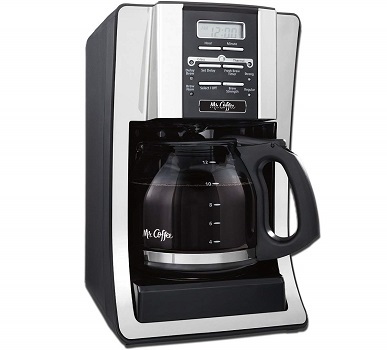 • Coffee may drip for several minutes after brewing. 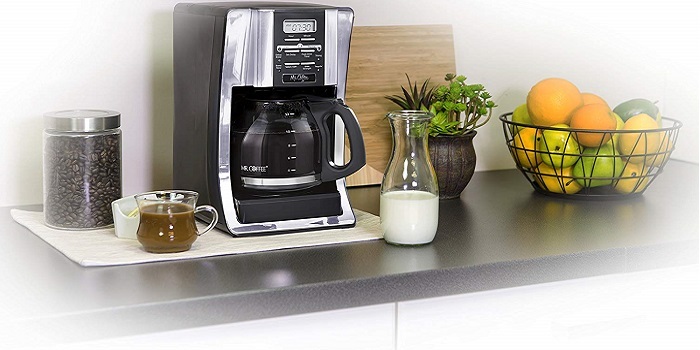 Hamilton Beach 48464 offers convenient one-hand dispensing without a conventional glass carafe. There's no pouring or spills, and nothing fragile to break and replace. Its gentle heater maintains coffee’s temperature without scorching the flavor, so your last cup tastes as fresh as the first. • Easy and Quick brewing. • Press bar to dispense. It's ready when you are. 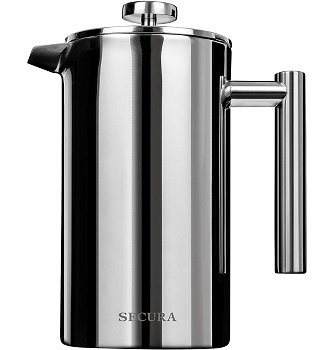 The double-wall construction of the carafe guarantees that your beverage will stay warm for up to 30-60 minutes. 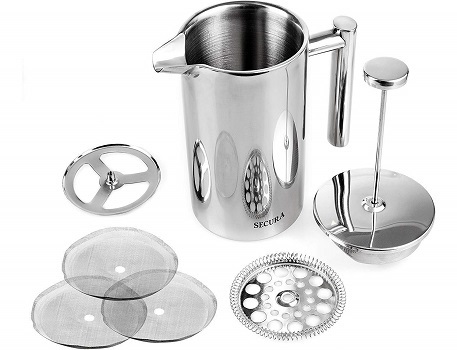 When it comes to the quality of the coffee produced by Secura SFP-34DS, you needn’t worry that coffee grounds might end up in your mouth because the 3-layered stainless steel filter will eliminate even the smallest of them. • No water level indicator. • Wide spouts pours faster than expected. • Stainless Steel Screen included - easy to disassemble and clean. Stack one or more screens together gives your espresso a more refined taste.